102,000 miles and engine untouched. Owned for 10 years, now sold. Great looks, great sound, great performance. Although based on a simple chassis the Capri was always an exciting car and in the 2.8i form was the most exciting with 0-60 mph in about 8 secs and a top speed of 130mph. all from an easily maintained motor, and it looked the part. Ford's sales pitch that it was the 'car you always promised yourself' at an affordable price was very appropriate. The one drawback, as so often, was that the brakes were never upto the job because the 13 inch wheels were too small to fit big enough discs, with the result that only hard pad material would give decent high speed braking but that meant poor low speed braking. Various kits have been available to improve things by fitting 4 pot callipers from other cars but Ford should have got it right in the first place. 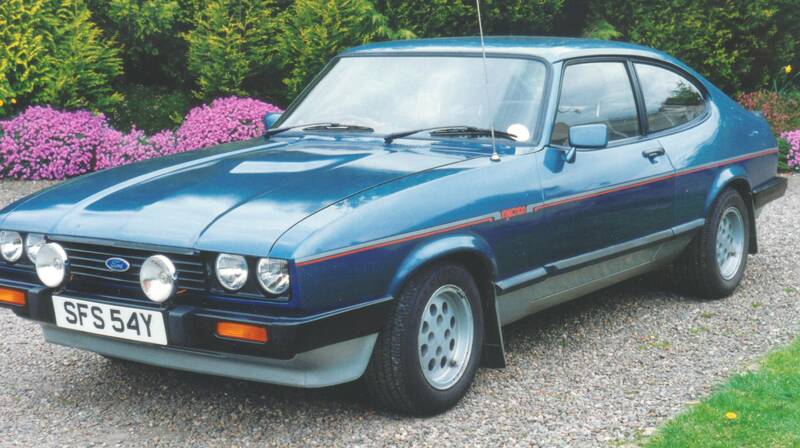 The 3 litre Capri had a reputation for being tail happy in the wet but the 2.8i was lower with stiffer springs, bigger roll bars, fatter lower profile tyres (205/60VR13) and was altogether a more refined motor especially with the 5 speed box that gave 130 mph at only 5,000 rpm. By the time SFS 54Y was 15 years old it was getting quite rusty inspite of my best efforts and was no longer my pride and joy - it would have cost far too much to fix and so it had to go. I would buy another if I could find a good one.